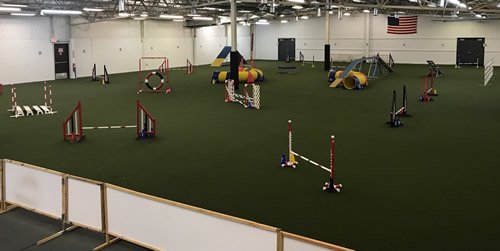 IncrediPAWS Dog Training, located east of Columbus in Pataskala, Ohio, offers an agility training area of 120' x 80' with turf flooring. The building is heated for cold weather training, air-conditioned for the summer months, and is easily accessible from I-70--only 18.5 miles from the airport. IncrediPAWS offers a turf flooring to allow for ideal running and turning conditions for dogs and handlers. The turf is a product of GrassTex that was designed for putting greens (product PL307). What do we like about this surface? One bit of caution - handlers need shoes with low traction to avoid "sticking" to the floor. Trail shoes do not work well. For more information, contact GrassTex at www.grass-tex.com or 1-100-544-0439. From the west: Take I-70 E towards Wheeling to exit 118 (OH 310/Pataskala.) Turn right onto OH 310 with an immediate right onto Columbus Parkway. Travel 0.3 miles & you will find IncrediPAWS located on your left. From the east: Take I-70 W towards Columbus to exit 118 (OH 310/Pataskala.) Turn left onto OH 310 and travel 0.3 miles turning right onto Columbus Parkway. Travel 0.3 miles & you will find IncrediPAWS located on your left. Please remember to check current pet policies and rates.